Book Review of Christos Efstathiou, E.P.Thompson: A Twentieth-Century Romantic (London: Merlin Press, 2015). pp. x + 248. £25 HB. Accordingly, the book is arranged in a broadly chronological sequence divided into four parts: Thompson and the Communist Party of Great Britain(CPGB); Thompson and the New Left; Thompson and the Peace Movement; and Leaving Babylon. His history is explored principally to shed light on his politics rather than as a central preoccupation, as in many other studies. Indeed, Efstathiou says that the works by Harvey Kaye and Bryan Palmer, among others, could not really help us to understand Thompson’s politics because they were too close to his perspective. Thompson’s liberal, anti-imperialist family background, including his admired elder brother’s embrace of communism; his formal and informal education at Cambridge; and the anti-fascist popular front left politics of the late thirties and war years were all part of why he joined the Communist Party. His university studies were interrupted by war service in North Africa and Italy which, along with his brother Frank’s death while fighting with Bulgarian partisans, encouraged him to look to a united, socialist Europe as his brother had done. Those politics, combined with the study of history and literature, drew him into a deep curiosity about the common people and their radical traditions. His association with the Communist Party Historians Group brought him closer to many of those who turned the focus of their research to ‘history from below’. His teaching mature aged students in the extramural department of Leeds University confirmed his interest in the popular culture of ordinary people. His first major work, a lengthy biography of William Morris, sought to rescue Morris from the art historians and emphasise his revolutionary politics as one of the early socialists in the British radical tradition. Thompson insisted that Morris’s moral positions were a neglected but necessary complement to the Marxist socioeconomic and political imperatives. Writing that biography was the occasion for him to abandon his plans to write a PhD thesis. Rather than leave the Communist Party, as so many did, immediately after the 1956 revelations of Stalin’s crimes, Thompson and his friend John Saville sought to widen internal debate about the Party’s defensive reaction to Khrushchev’s speech. In an attempt to reposition the CPGB at the centre of a broad united front of the labour and radical movements, they established a journal, The Reasoner, as the organ to publish constructive debate about realigning the Party more in line with a British popular, radical humanist tradition. They met some resistance, especially from the Party bureaucrats who ordered them to shut it down. They were going to issue a final, third edition just as the Hungarian uprising was brutally suppressed. They were suspended but decided to resign from the Party. A year after leaving the Party, Thompson published an essay that decried the theoretical orthodoxy of the CPGB and outlined his version of socialist humanism. The publication of the New Reasonermarked the emergence of a New Left which developed in directions that were not always the same as Thompson had envisioned. While being actively engaged in debate over the direction of the New Left, Thompson wrote his Making of the English Working Class, the book that made him famous. Efstathiou does not explore that book very thoroughly for its significance to the growing prominence of history from below. In fact, there are only eleven pages specifically devoted to that landmark work. The definition of class that Thompson sketched out in the Preface to The Making… was a concise statement of the position he adopted in debates with a new generation of Marxists, several of whom were enthralled by structuralist theory, most notably that of Louis Althusser. 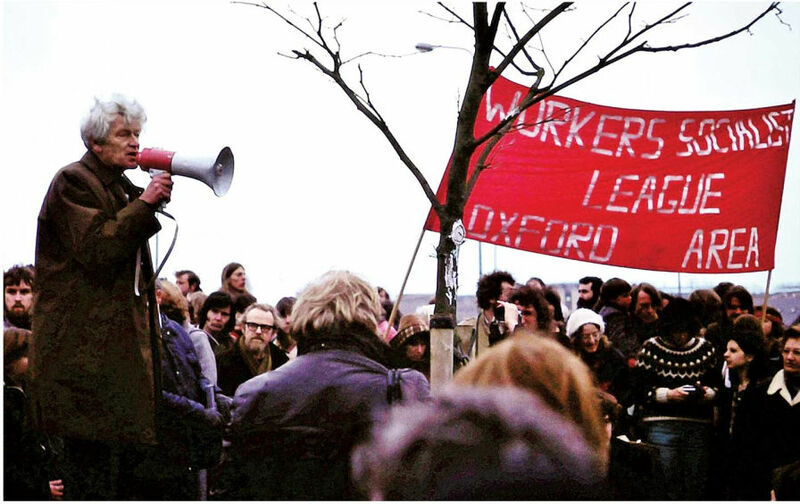 While still producing work that set the standard for much historical writing in social and labour history, he was also engaged with the development of new journals like Universities and Left Review and the New Left Review, both of which took directions that were more academic and theoretical with not much attention to the broader left and labour movement. They were the emerging new, new left. Efstathiou gives considerable attention to Thompson’s tussles with these more abstract, sometimes obtuse theories. It was surprising that in discussing Thompson’sPoverty of Theory broadside at Althusser, Efstathiou chose not to quote that glorious rhetorical flourish of Thompson in full cry, “So at last in Althusser, Stalinism has found a theory.” Nevertheless, there is an informative and very balanced assessment of Thompson’s steady alienation from the new, New Left and his arguments with several of its leading figures on pp.102-115. It might seem a little unfair of me to look for more about Thompson’s period at the Centre for the Study of Social History in Warwick University (1966-71) where he published some very fine work such as his seminal articles in Past and Present on “Time, Work-discipline and Industrial Capitalism” and “The Moral Economy of the English Crowd in the Eighteenth Century”’. Two of his well-regarded books came out of this period, Albion’s Fatal Tree, a collaborative work with some of his postgraduate students and his Whigs and Hunters. I acknowledge Efstathiou’s expressed focus on Thompson’s politics, but the progressive alienation from the second generation of the New Left was only one aspect of his political shift towards peace movement activism. His disenchantment with universities grew out of the revelations about how Warwick had become very closely associated with business interests, see Warwick University Limited(1970). Nevertheless, Efstathiou makes a good point when he suggests that Thompson’s rather romantic notion of the New Left making common cause with the labour movement and the working class in a Popular Front to win a peaceful socialist transition left him rather isolated on the left by the mid-1970s. Thompson left Warwick in 1971 to concentrate on his writing. Whigs and Hunters(1975) and Albion’s Fatal Tree(1975) grew out of his time at Warwick but from the mid-1970s he became a very public figure as a reviewer, essayist, and polemicist. His most prominent work in this period was his ferocious attack on Louis Althusser and all his works. It was a final settling of scores with his new New Left critics who had moved on from his humanist socialism to something more theoretically astringent. Many of his essays from 1970s to early ‘80s were collected in Writing by Candlelight and The Heavy Dancers. In the third part of the book Efstathiou examines Thompson’s role in the peace movement. He had been active in campaigns for peace during his Communist Party period in the early 1950s and attended the initial meeting of the Campaign for Nuclear Disarmament (CND) in February 1958. CND inspired Thompson with its democratic, cross-party character and gave hope that it might be given a socialist dimension in conjunction with other progressive organisations, including a left leaning Labour Party, in a Popular Front strategy. When CND slowly declined Thompson looked further afield. Alarmed at the announcement of the deployment of cruise missiles across Western Europe, he approached Tony Benn to help organise left wing Labour members who would be part of a broad Popular Front alliance with Communists, Christian groups and many of the pacifist organisations that had been in CND. Ken Coates, director of the Bertrand Russell Peace Foundation joined him in recruiting five more prominent campaigners and set up European Nuclear Disarmament (END). Thompson’s vision was for a pan-European movement covering both NATO and Warsaw Pact nations, arising from civil society groups who would create a pan-European people’s détentéand work towards nuclear disarmament and, more broadly, the creation of a ‘third way’ to a united democratic socialist Europe. Efstathiou offers a detailed and judicious account of the rise of END to a prominent social movement in Western Europe and, to a lesser extent, Eastern Europe and its eventual decline as the Cold War began to thaw. From around 1988 Thompson went ‘back on the tools’ of history and literature. In 1988 he published a satirical novel, The Skyaos Papers, and in 1991 his long-delayed Customs in Common book appeared. He returned to his abiding interest in William Blake. Tragically, Witness Against the Beast: William Blake and the Moral Law was published after his death (from Legionnaire’s Disease and other ailments) in his garden with Dorothy by his side in August 1993. Efstathiou, quite reasonably, said at the beginning that a full biography cannot be written until Thompson’s personal papers are available fifty years after his death. He also notes the substantial body of critical work on Thompson’s history to which he refers but does not seriously engage with, unless to illustrate his argument about his politics. The central theme of this study––Thompson’s humanist socialism that preferred a Popular Front from below strategy for a morally aware transformation to a better world––is sustained throughout. In some ways, like a thesis, we are reminded of it at regular intervals. It is an earnest and worthy book that offers an interesting and well-argued case about Edward Thompson’s politics. If you want the fire and fury of Thompson’s polemics or the deeply empathetic presentation of the common people’s struggle for dignity and justice, other books will serve you better. This book is more a very forensic post mortem rather than a ringing eulogy.